The Zodiac Offshore Life Rafts have been redesigned for this year, making them more compact and lightweight than ever before. The offshore rafts are built to be more comfortable and well equipped when there is a chance of being at float for more than a day and further from shipping traffic! The Zodiac "Open Sea" offshore raft models are approved by the ISAF as a suitable for long distance cruising and racing! Choose between a soft valise storage bag or a hard shell canister for deck mounting (requires additional cradle and hydrostatic release mechanism). 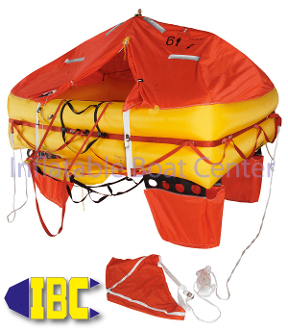 All life rafts are special order as the service interval begins immediately after initial packing. This is a hazmat item and can only be shipped via ground - additional charges will apply - please inquire!